The Nutanix Enterprise Cloud Platform eliminates the need for traditional SAN and NAS solutions by employing a highly distributed software architecture. It delivers a rich set of software-defined services that are entirely VM-centric, including snapshots, high availability, disaster recovery, deduplication and more. Nutanix web-scale solutions employ a variety of advanced mechanisms to drive the highest possible performance for a wide range of virtualized workloads. Powerful acceleration capabilities such as caching, automatic data tiering and data locality speed storage performance. Server-attached flash storage is used both as a high-performance read cache, as well as a persistent data tier in a Nutanix hyperconverged system. Application and user data is automatically placed in the optimal storage tier – flash or HDD – to yield the fastest performance and optimize capacity in the cluster. The most frequently accessed data (“hot” data) is placed in the SSD or cache tier for near instantaneous access by VMs. As data becomes “cold,’”it is demoted into the higher capacity HDD tier for more efficient storage, so that SSD and cache capacity remains available for new “hot” data. MapReduce technology manages data placement as a distributed, background process to ensure negligible impact to real-time performance. Support for heterogeneous cluster that includes Hybrid, all flash, and compute heavy nodes. New optimized datapath for AHV IO. No VM reconfiguration required (single SCSI adapter). End-to-end support for I/O sizes from 512 bytes up to 1 MB ensures optimal performance across a wide range of workloads and delivers application-tuned metadata efficiency. Unlike traditional storage systems that break up incoming I/O requests into fixed 4KB chunks, Nutanix efficiently handles block sizes of variable length across the entire write path. Support of RDMA in node to node replication paths. Optimized CVM-CVM communications to benefit all NDFS storage operations. Support for low latency and high performance NVMe SSD drives. Enable better desktop experience for VDI by supporting nVidia vGPUs: Tesla M10 & M60. The Nutanix platform is fault resistant, with no single point of failure and no bottlenecks. A shared-nothing architecture – where all data, metadata and services are distributed to all nodes within the cluster – is built to detect, isolate and recover from failures anywhere in the system for an always-on operation. Intelligent data placement across different physical domains (e.g., separate racks or power sources) protects against appliance and rack failures. Availability domains allow Nutanix clusters to survive the failure of multiple servers in a physical enclosure without loss to data or service, providing greater system-level resilience without increasing storage capacity. Administrators can configure and manage availability domains at the Block or Rack level. Administrators can configure data redundancy based on application SLAs and the criticality of the data set, with a replication factor (RF) of two or three. If a node fails, data is automatically read from other nodes. If the node does not come back online, all data on the affected node is automatically reconstructed to ensure full redundancy and data protection. Data is written to a VM’s local node and is synchronously replicated to one or more other nodes in the cluster, ensuring that all data exists in at least two independent locations and remains highly available. Multiple copies of data ensure 100% data availability in the event that a Nutanix Controller VM is unavailable due to failure or maintenance. If the Nutanix Controller VM becomes unavailable, Nutanix auto-pathing automatically re-routes requests to a healthy Controller VM running on another node in the cluster. Every node in a Nutanix cluster has access to all replicas so that I/O requests can be serviced immediately by any node, providing N-way, fully fault-tolerant failover for all VMs in the cluster. The system scans data in the background and checks against checksums in the metadata store. If it detects an error, it will overwrite the bad data with the good copy. On every read, a checksum is computed for the data being read and compared with the stored checksum. In the case of an inconsistency, the error is corrected. If a drive fails, the system automatically runs a scan and replicates any data that is not redundant. During the failure and recovery process, both data and access to data are preserved. 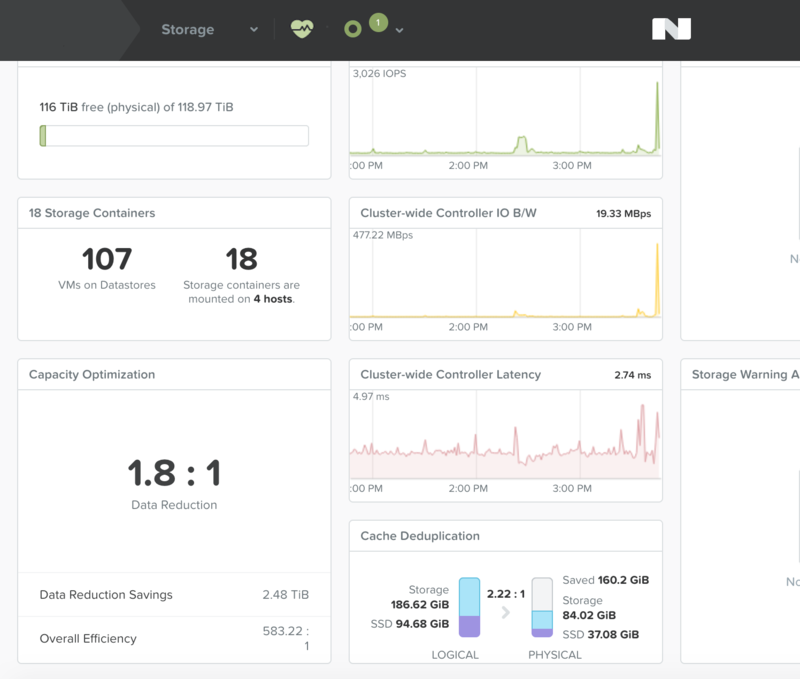 Nutanix incorporates a wide range of storage optimization technologies that work in concert to make efficient use of available capacity for any workload. Deduplication and compression technologies are intelligent and adaptive to workload characteristics, eliminating the need for manual configuration and fine-tuning. Erasure coding offers deterministic capacity savings regardless of workload characteristics. Removes duplicate data in the content cache (SSD and memory) to reduce the footprint of an application’s working set, enabling more working data to be managed in the content cache for better performance. Global, post-process MapReduce deduplication reduces repetitive data in the capacity tier to increase the effective storage capacity of a cluster. 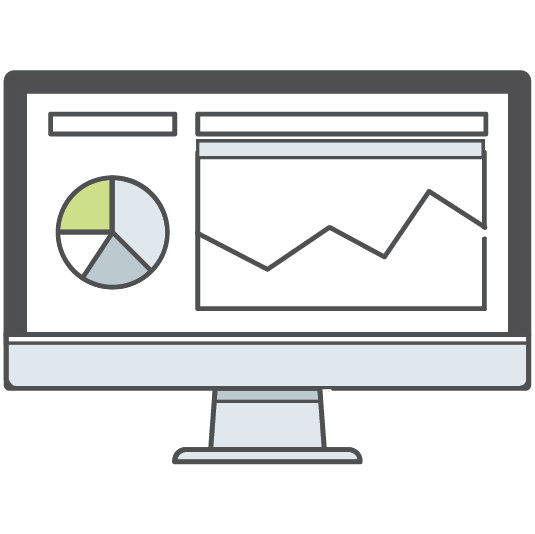 Easily configured and managed at vdisk granularity for fine-grained control. Data compression can be enabled as an inline capability as data is written to the system, or post-process as a series of MapReduce jobs after the data has been written, eliminating any impact on write path performance. Unlike traditional architectures where compression operations run on one or two CPUs, Nutanix compression runs on each node in the cluster to leverage all system compute and memory resources. Nutanix uses the Snappy compression algorithm to compress a variety of data types more efficiently, and includes the option to compress data at the sub-block level for greater simplicity. A mathematical function is applied around a data set to calculate parity blocks, which can then be used to recover data in the event of a failure. Nutanix systems switch between data replication for hot data and erasure coding for cold data based on I/O frequency to optimize performance and storage. This patent-pending algorithm distributes coding and rebuilds across the entire cluster to reduce vulnerability windows in the event of failures, and maintains data locality. Improve performance with distributed caching of VM data for linked clones, redirect-on-write snapshots and writeable clones at the granularity of a single VM. Redirect-on-write snapshots and writeable clones at the VM level increase efficiency, while differential forever snapshots impose lower capacity overheads on the system. Unlike systems that snapshot data at a volume or LUN level, Nutanix snapshots and clones are performed for individual VMs for fine-grained data management and protection. Create clones (writeable snapshots) of a base image in seconds, leveraging integration with popular offload capabilities, including the VMware API for Array Integration (VAAI), Microsoft Offloaded Data Transfer (ODX) and SMI-s. Shadow Clones are a unique Nutanix feature that significantly improves performance by caching virtual machine data across a Nutanix cluster. Gain performance where there are multiple VMs reading a single source of data, or in VDI deployments with linked clones (e.g., Citrix MCS Master VM or VMware View replica disks). If read I/O requests originate from more than two remote Controller VMs (CVMs) and the local CVM, the vDisk is marked as immutable and cached locally, so read operations are satisfied by direct-attached storage resources.